Divestment of minor, non-core assets. Clearview’s previously announced operated, horizontal well located on the Company’s Wilson Creek core property at 15-20-44-4W5M (“15-20”) (85% working interest) has completed its first 120 days of continuous production (“IP120”) and has recovered over 33,000 barrels of light oil to date. During the IP120, the well produced a gross average of 243 barrels of light, sweet oil per day and 258 barrels of oil equivalent per day (“boe/d”). This production exceeds the Company’s type curve IP120 estimate for oil of 205 bopd. 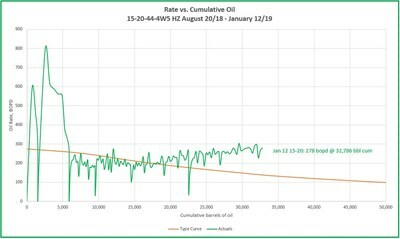 The graph below depicts the 15-20 well’s oil production rate relative to the cumulative amount of oil produced along with the Company’s type curve for comparison. The 15-20 oil production rate has been increasing over time without any changes to the pumping and gathering system operating on the well. Clearview’s previously announced horizontal development well (100% working interest) on the Windfall core property targeting light, sweet oil in the Bluesky Formation at 1-3-59-15W5M (“1-3”) commenced production on November 22, 2018. Over the first 32 days, the 1-3 well was produced at restricted rates during its cleanup phase into the Company’s operated oil facility. During its first 30 days of continuous production (“IP30”), the well produced an average of 102 bopd and 286 thousand cubic feet of natural gas per day for a combined total of 149 boe/d. The most recent 14-day average of production for 1-3 was 198 bopd and 305 boe/d. 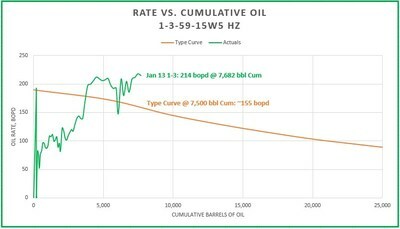 The Company’s type curve IP30 estimate for oil was 173 bopd. The graph below depicts the 1-3 well’s oil production rate relative to the cumulative amount of oil produced along with the Company’s type curve for comparison. The productivity potential of the 1-3 well will become more defined over the coming months. The Company has mapped an additional 16 net Bluesky horizontal drilling locations on this property. Consistent with the Company’s strategy of transformation into an operated, growth-oriented producer, Clearview has sold two of its minor, non-core assets Warburg and Crossfield for nominal proceeds. These assets were non-operated, low working interest units that produced at a combined rate of 4.8 bopd net to Clearview. The divestment closed on December 20, 2018. This press release contains forward-looking statements and forward-looking information (collectively “forward-looking information”) within the meaning of applicable securities laws relating to the Company’s plans and other aspects of our anticipated future operations, management focus, strategies, financial, operating and production results, industry conditions, commodity prices and business opportunities. Specifically, this press release has forward looking information with respect to: future drilling plans; waterflood recovery and overall growth strategy. Forward-looking information typically uses words such as “anticipate”, “believe”, “project”, “expect”, “goal”, “plan”, “intend” or similar words suggesting future outcomes, statements that actions, events or conditions “may”, “would”, “could” or “will” be taken or occur in the future. Statements relating to “reserves” are deemed to be forward-looking statements, as they involve the implied assessment, based on certain estimates and assumptions, that the reserves described can be profitably produced in the future. References herein to 30 or 120 day initial production rates and other short-term production rates are useful in confirming the presence of hydrocarbons, however, such rates are not determinative of the rates at which such wells will decline thereafter and are not necessarily indicative of long-term performance or of ultimate recovery. While encouraging, readers are cautioned not to place reliance on such rates in calculating aggregate production for us or the assets for which such rates are provided. A pressure transient analysis or well-test interpretation has not been carried out in respect of the well. Accordingly, we caution that the test results should be considered to be preliminary. Unbooked locations have been identified by management as an estimation of our multi- year drilling activities based on evaluation of applicable geologic, seismic, engineering, production and reserves information. There is no certainty that we will drill all unbooked drilling locations and if drilled there is no certainty that such locations will result in additional oil and gas reserves, resources or production. The drilling locations on which we actually drill wells will ultimately depend upon the availability of capital, regulatory approvals, seasonal restrictions, oil and natural gas prices, costs, actual drilling results, additional reservoir information that is obtained and other factors. While certain of the unbooked drilling locations have been de-risked by drilling existing wells in relative close proximity to such unbooked drilling locations, other unbooked drilling locations are farther away from existing wells where management has less information about the characteristics of the reservoir and therefore there is more uncertainty whether wells will be drilled in such locations and if drilled there is more uncertainty that such wells will result in additional oil and gas reserves, resources or production.